Another Dutch prog band on offer here. 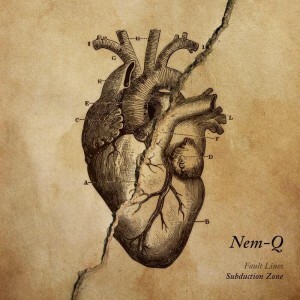 Nem-Q first serve is an EP with 4 songs and a total playing time of almost 21 minutes. No surprises in the 5 man cast, with all regular instruments present. Opener Inner Struggle is on the somewhat heavier side of the modern or neo prog movement. Which gives it bite, and that is a good thing. Singer Paul has a pretty good voice and the arrangement is cleverly coloured with harmony vocals here and there. Second track Shooting Stars opens calm, with voice and acoustic guitar. Piano and keyboards are slowly adding more movement but for me the song seems to be going nowhere. This would probably work better as a moment of reflection on a album filled with energetic songs. Next track Vanity brings that energy. The strange thing here is that the vocals are buried a lot in the guitars. The vibe is a bit Porcupine Tree like and they do it well. Closer Desaturate is the short one, clocking in at two and a half minutes. Alas it is again a reflective piece, and instrumental too.